I caught a small break the other day. The baby went right back to sleep after a morning feeding and I had a chance to make some muffins. My mother used to make chocolate chip muffins for us when I was a kid. She was a great cook when it came to Albanian food but American cuisine….ehhh….not so much. She used a hand mixer for the muffins and she used regular sized chocolate chips. Over-mixing made the muffins tough and the chocolate chips were too heavy and sunk to the bottom of the muffin. I love this recipe from The America’s Test Kitchen Baking Book. I used the Mocha-Chip variation for my recipe but left out the coffee flavor. There are about seven variations to this recipe like Lemon-Blueberry, Banana-Walnut and Raspberry Almond but Chocolate Chip is my favorite so that’s the one I’m including today. 2. Whisk the flour, sugar, baking powder, baking soda, and salt together in a large bowl. In a medium bowl, whisk the eggs and then whisk in the yogurt until smooth. Gently fold the yogurt mixture into the flour mixture with a rubber spatula until just barely combined, then fold in the melted butter followed by the mini chocolate chips. 3. 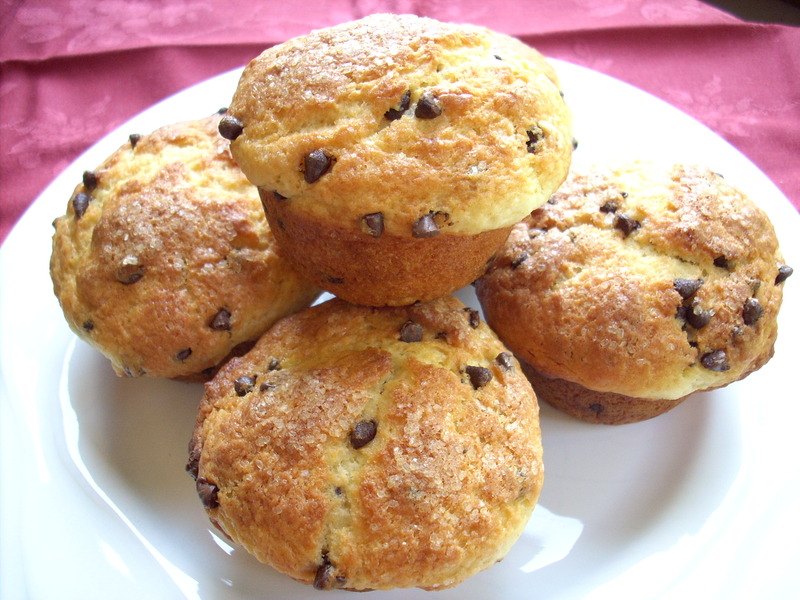 Using a greased 1/3-cup measuring cup, portion the batter into each muffin cup. Bake until golden brown and toothpick inserted into the center of a muffin comes out with just a few crumbs attached, 25 to 30 minutes, rotating the pan halfway through baking. 4. Let the muffins cool in the pan for 5 minutes, then flip out onto a wire rack, and let cool for 10 minutes before serving. This entry was posted in Recipes, Sweets. ← Hello World! I’m back! I love your recipes so I’m really happy you’re back to blogging. Congrats on the new baby!